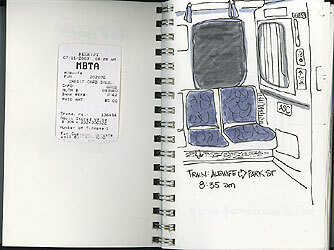 My sketchcrawl day started at about 8:30 a.m. when I arrived at Alewife MBTA station. I’d been on the road for nearly two hours, so it was a relief to park the car and begin the day’s adventures. My first sketch was on the train. 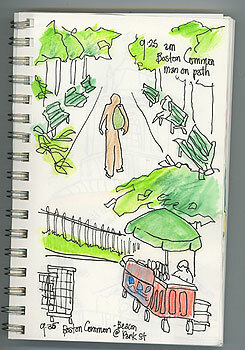 I decided to take photos at each sketch location — when possible — to document the day in sketches and photos. Also, like my travel journals, I kept my receipts in my sketchbook, as well. 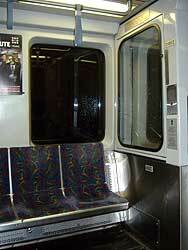 You can see one of them, below, on the page facing my first sketch. I wasn’t entirely happy with the b&w effect of monochrome felt tip pens. So, when I arrived at the sketchcrawl meetup location (Visitors Ctr at Boston Common), I switched to pencil… and almost immediately regretted it. I didn’t finish that sketch. After that, I returned to felt tip pen. For the line drawing, I was using the waterproof Pigma Micron pen, 08. However, even though it’s technically waterproof, I let the ink dry thoroughly before adding any color. 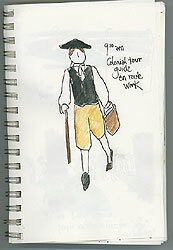 Man in Colonial garb on his way to work. The next two sketches — on one page — were drawn from the same location as the previous sketch. 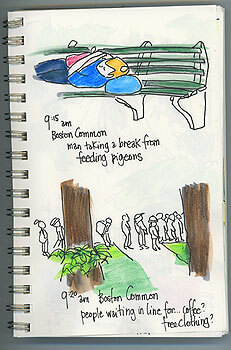 Mostly, I was using up time in case any late arrivals for the sketchcrawl showed up. 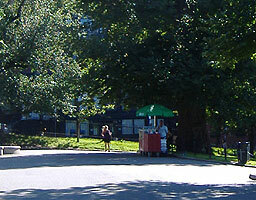 Man on park bench; people waiting in line. Next, I stopped at the top of the hill, where a man was setting up his beverage stand. 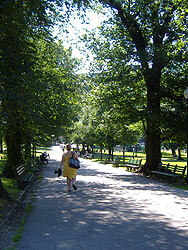 Cool and shady path across Boston Common.